My family just got back from Disneyland last weekend. We all had a blast! I must admit, though, that it was a lot more work than I ever thought it would be. Next time I’ll plan a vacation for my husband and I AFTER we take the kids on vacation! 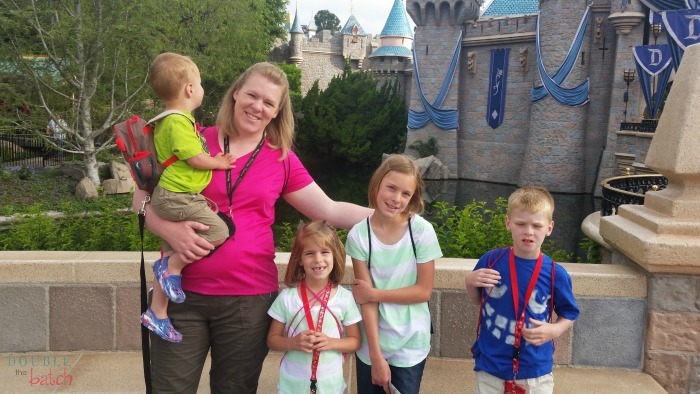 If you are planning a trip to the “Happiest Place on Earth” I have some great tips for saving yourself some money. I definitely wish I had done some things a little differently on this trip. I could have saved a huge amount of money if I had just planned a little more ahead. My loss is your gain! 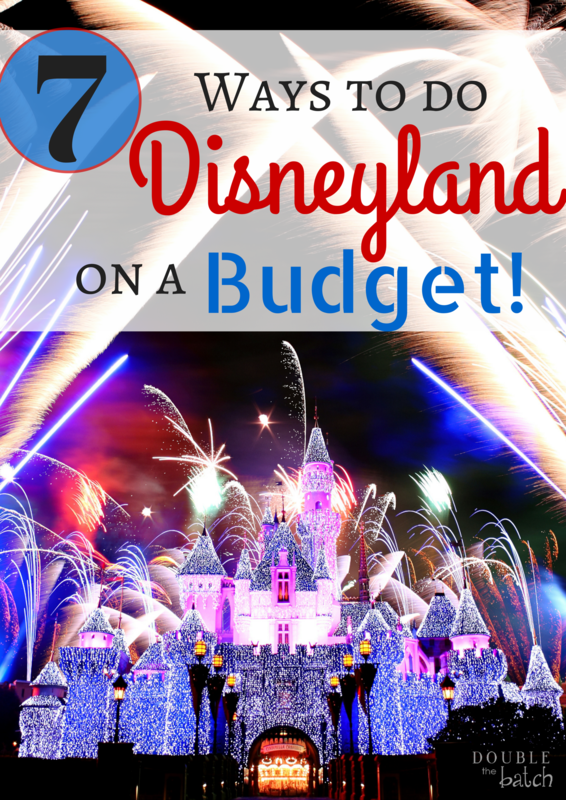 Here are 7 ways to do Disneyland on a budget! 1. Make your hotel reservations several months in advance. I know this one is kind of a no-brainer, but I was shocked at the difference in prices when we had to make a last minute reservation to one of our hotels. Hotels in Aneheim book up really quickly! If you know someone that lives close by that will let you camp out at their house…even better! Make sure you shop around as there are MANY places to choose from! We went through Getaway Today for this because they specialize in Disneyland vacations and have personally stayed in all of the hotels they recommend. They will also beat any price you find on both hotel and Disney tickets, so it’s a no-brainer. 2. 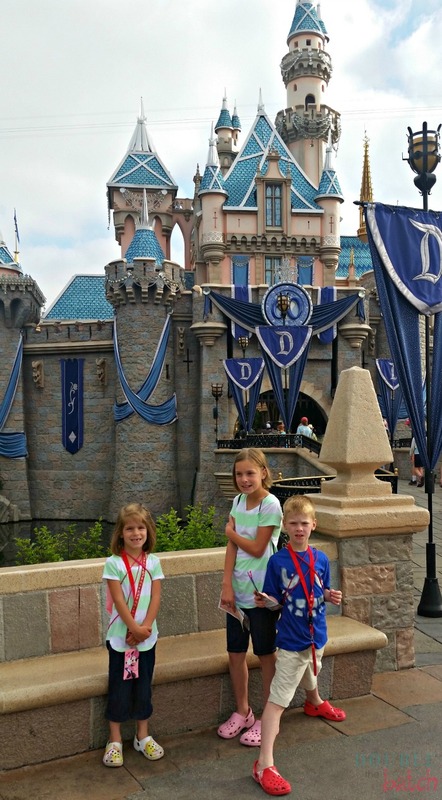 Let your kids start to earn their own “disney bucks” by doing extra chores, behaving, etc. several months before your trip. That way when they see items they want in the park (and they WILL) they will already have their own budgeted money giving your pocket book a huge break! When they run out of money, souvenir time is over. We paid our kids an allowance for doing their chores for the 6 months before we went to Disneyland. You can find the link for “Disney Bucks” over at Mother’s Niche here. 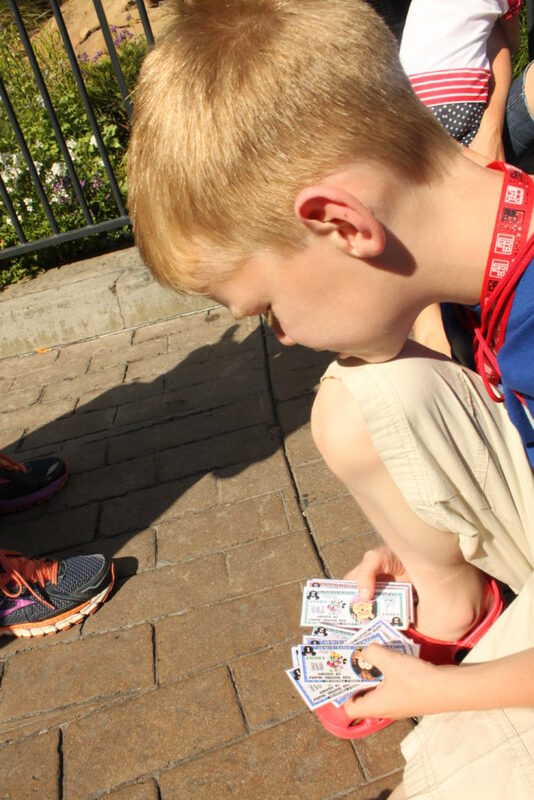 This is a cute pic of my son counting his disney bucks while were in line. 3. Buy some Disney souvenirs BEFORE your trip. A lot of the fun disney souvenirs can actually be bought for cheaper online. I knew my kids would need something to keep their disney bucks and fast passes in so they wouldn’t get lost so I found these cute lanyards on Amazon for them. We also bought everyone disney drawstring totes to keep snacks and drinks in. I knew that I would end up carrying everything if we didn’t. If you’ve ever walked around Disneyland from 7 am to midnight you know that you DO NOT want to be hauling around extra stuff! 4. 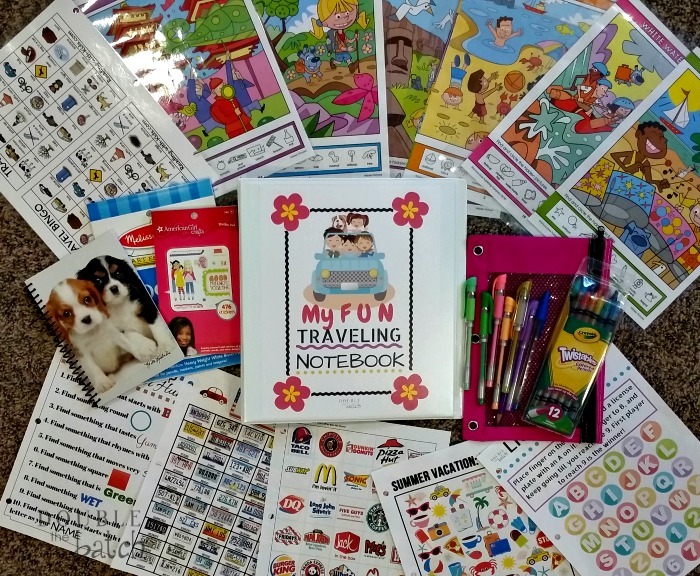 Make your own Travel Binders to keep your kids busy in the car or on the plane (we drove). Here is a post I wrote with directions for your own DIY Road trip binder. I also included all the links I used for the free printables. 5. DRINKS! Take your own drinks! I had heard that there were places to get free water so I stupidly didn’t take any of my own. 3 hours into our first day, after rushing around trying to get the best rides before the lines got too long, we were all parched and the only options close by were bottles of water for $3 each! I did find a restaurant where I could get free cups of water but I had to wait in a very long line and then try and figure out how to juggle it all till I got back to where my husband was waiting. The following day, you better believe we brought our own drinks! 6. Food. This is where we could have saved the most money. I foolishly thought we could just buy 2-3 things and the 6 of us could share. While the portions on some of the food at Disneyland are definitely generous (and delicious!! ), trying to get a toddler to share a corn dog or a 5 yr old to share a churro just ended up being a nightmare. 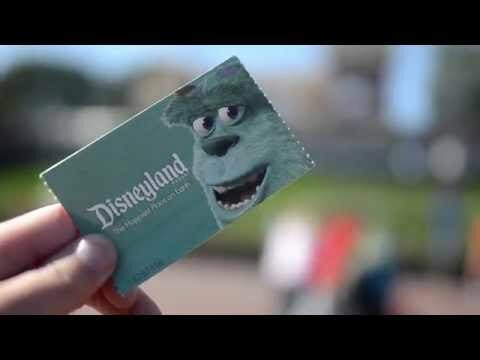 Even if you plan on eating a special meal at Disneyland, take snacks! A package of fruit snacks or an applesauce pouch might make the world of difference to kids when you are waiting in a long line. 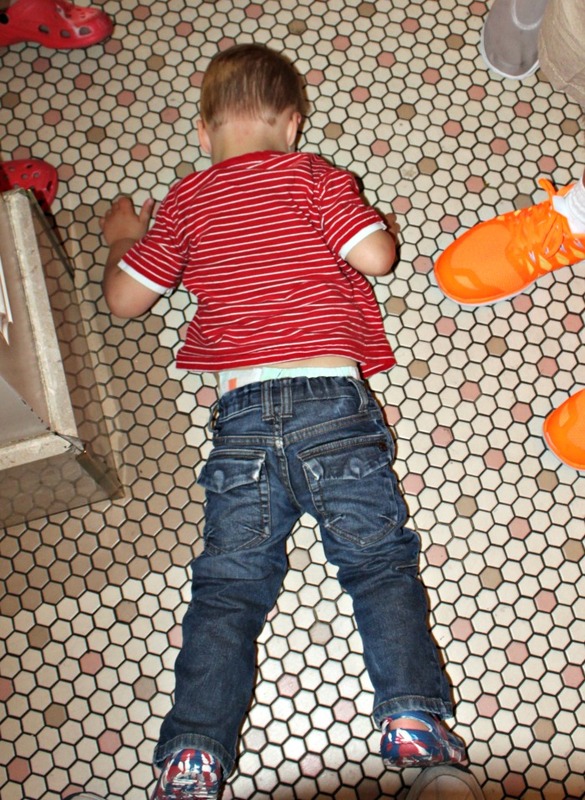 The following picture of my 2 yr old proves this. (I packed LOTS of snacks for him the next day!). If you want to do Character Dining, (which we LOVED!) purchase your tickets ahead of time through Get Away Today and your taxes and tips will be included saving you up to 10% (which is a lot when it comes to Disney Dining)!